Why is conversion important? Conversion is the process of ensuring data is of the right object or type. This can be very helpful by eliminating erroneous information from getting into your system. In the JSF lifecycle, conversion occurs in the apply request values phase. This is before component data is bound to your backing bean model. By having it occur in the apply request values phase you can make certain assumptions that the data being sent into the backing bean will be of the correct type. This helps you to focus on business login rather than qualifications of input data. Allow a commandLink or commandButton to navigate the user to another page without processing any data currently in input fields of the scuurent screen. In particular, this allows navigation to occur even when there are currently validation errors. Ex: a "Cancel" button. Allows a commandLink or commandButton to trigger back-end logic while ignoring validation for some of the fields on the screen. Makes one or more input components "high priority" for validation, so that if any of these are invalid then validation is not performed for any "low priority" components on the same page. This can reduce the number of error messages shown. Using the immediate attribute on a component means its value will be validated during the apply request values phase in the JSF lifecycle. Since conversion already occurs in this phase the use of this attribute when conversion is concerned is not needed. The immediate attribute is used more in validation instead of conversion. <f:converter/>: Adds an arbitrary converter to a component. converterId: The id of the converter. <f:convertDateTime>: Adds a date/time converter to a component. type: date(default), time, or both. dateStyle: default, short, medium, long, or full. timeStyle: default, short, medium, long, or full. pattern: Formatting pattern as defined in java.text.SimpleDateFormat. locale: Locale whose preferences are to be used for parsing and formatting. timeZone: Time zone to use for parsing and formatting. <f:convertNumber>:Adds a number converter to a component. pattern: Formatting pattern, defined by java.text.DecimalFormat. maxFractionDigits: Max number of digits in the fraction part. minFractionDigits: Min number of digits in the fraction part. maxIntegerDigits: Max number of digits in the integer part. minIntegerDigits: min number of digits in the integer part. integerOnly: True if only the integer part is parsed. groupingUsed: True if grouping separators are used. currencyCode: ISO 4217 currency code to use when converting currency values. currencySymbol: Currency symbol to use when converting currency values. This will now ensure that only integer values can be sent into the backing bean and not something else such as a character. In the screen shot below, you can see what happens when a non-integer value is entered. This will allow only whole numbers entered with a dollar sign and up to seven digits can only be entered at a time. Anything that breaches these conditions will cause a Conversion Error to be thrown. Download the converter-basic source code here. The demo application shows how to use converters to convert data to a proper type. Custom converters are nessesary if you need to convert field data into an application-specific object. 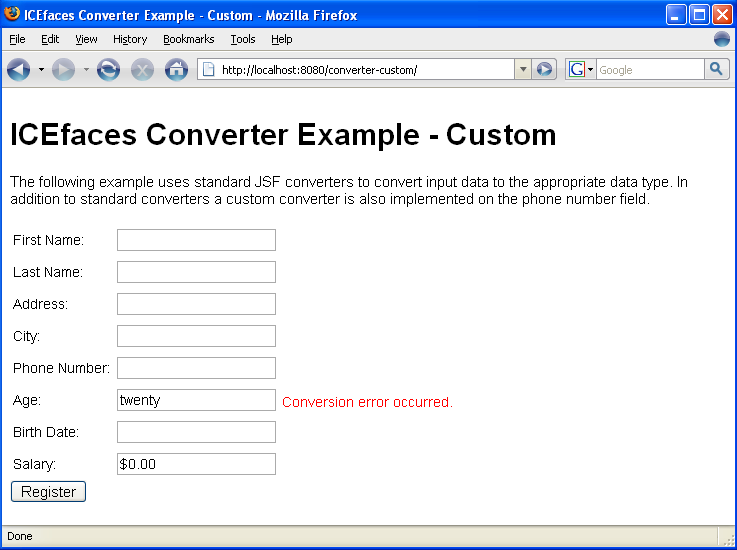 There are five main steps in creating a custom converter. Implement the getAsObject method, which converts a field (String) to an object. 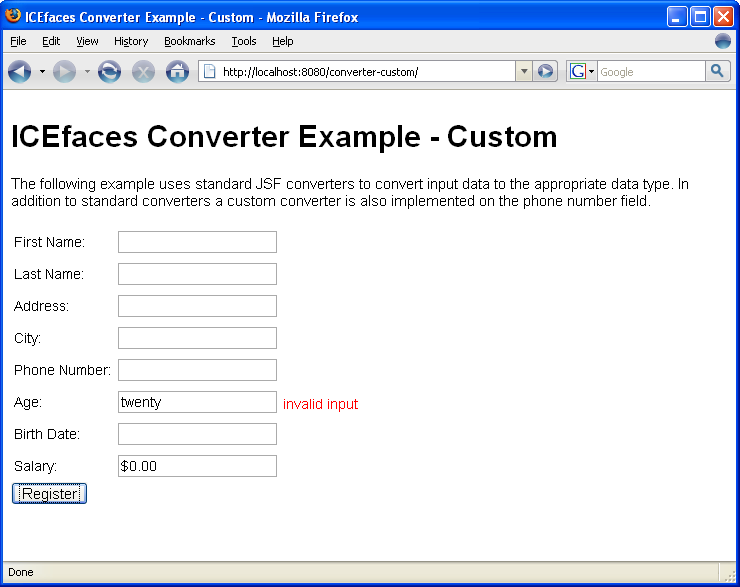 Register your custom converter in the faces context (faces-config.xml). Insert the converter into your JSP's with the <f:converter/> tag. The following is a step-by-step walkthrough on how to create a custom converter. Here the getAsString method converts a PhoneNumber object to a String. For the second option from step 4, there is no need to use the <f:converter/> tag since the PhoneConverter class handles all PhoneNumber objects automatically. Download the converter-custom source code here. This will now display the message "invalid input" beside the field that is causing the error shown in the screen shot below. 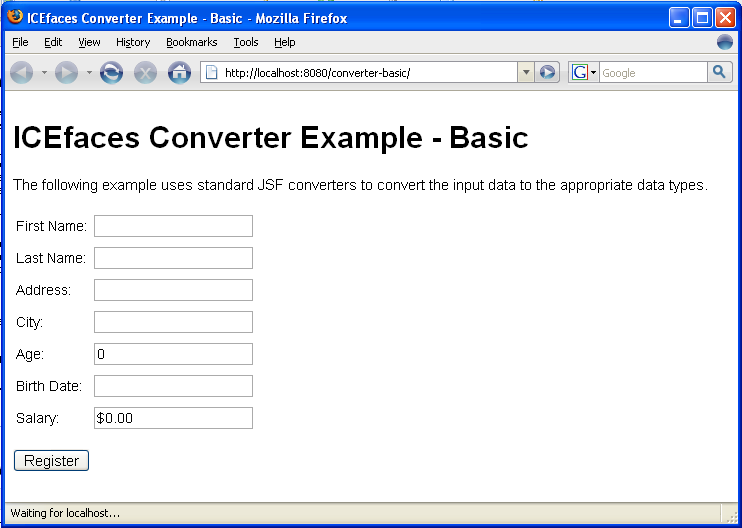 converter-basic converter-basic source code Simple example of how to use the standard JSF converters. 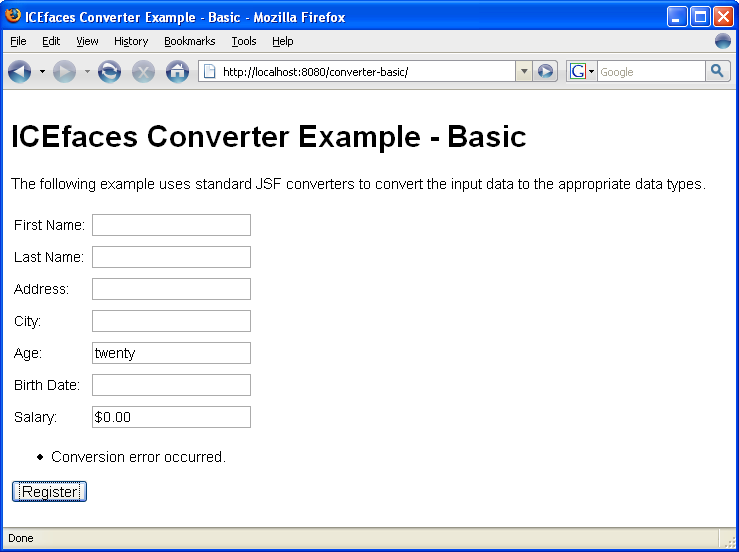 converter-custom converter-custom source code A custom converter is added to the converter-basic application.